So you’ve been accused of a crime. Maybe you’re completely innocent. Or guilty as sin. Either way, buckle up, because the well-worn wheels are now in motion. This ride will strip you of your humanity in a thousand ways. Your reputation will suffer. You will lose things: jobs, apartments, relationships. Maybe even your children. In the world of public opinion, the cloak of suspicion will feel heavy on your back. But things are different in the courtroom. Or at least, they’re supposed to be. Here, everyone is presumed innocent. The presumption of innocence isn’t an empty platitude. It’s an absolute right enshrined in the U.S. Constitution. Without it, justice crumbles. Nearly every miscarriage of justice can be traced by to violating a person’s presumption of innocence. It’s the single principle separating us from kangaroo courts, lynchings, and wrongful convictions. 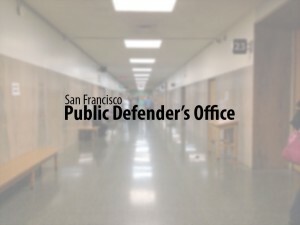 So when a public sign in sheet in a San Francisco courtroom listed defendants as “bad guys,” my fellow public defenders and I were alarmed. When the judge laughed off the incident as a joke, we got angry.